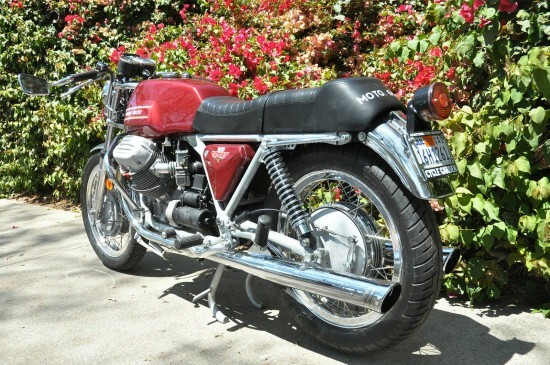 The original Moto Guzzi V7 Sport is one of our favorites, and it’s pretty easy to see why: while the modern café-racer and brat-style builders need to chop the living hell out of suspensions to get their creations to sit low, the V7 Sport had that look from the factory, and was one of the best-handling bikes of the era. 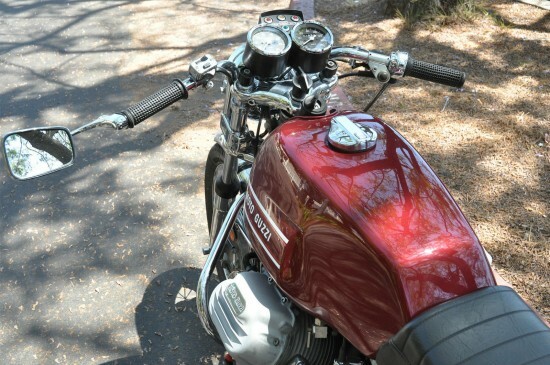 In fact the bike’s frame was redesigned from the V700’s “loop-frame” to lower the bike’s CoG: the new design switched from a generator to a compact new alternator and relocated it from the top to the front of the engine to clear up space for the frame’s top rails. And the new frame fit so closely around the engine that detachable lower rails were included to facilitate servicing. The engine was more evolutionary and less revolutionary: a punched-out version of the V700’s longitudinally-mounted, shaft drive twin, it featured a five-speed gearbox and the usual carburetor updates, along with highly-adjustable swan-neck clip-ons for a custom fit. 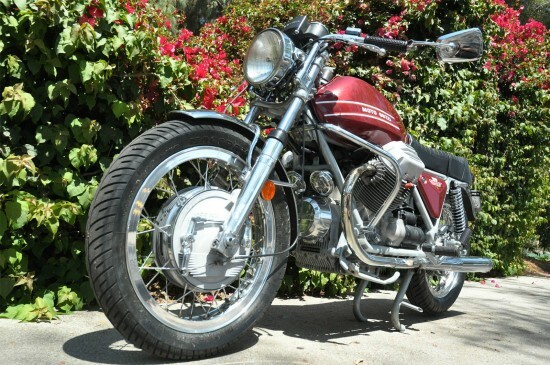 As the seller indicates, the bike displaces more than the original 748cc’s. 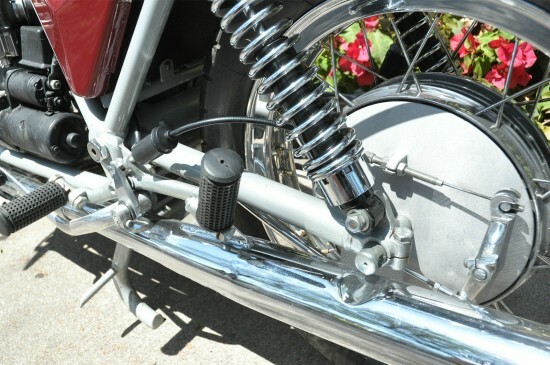 It’s pretty common to drop in larger pistons and different cranks from later versions of the bike, since it basically amounts to a factory big-bore kit. 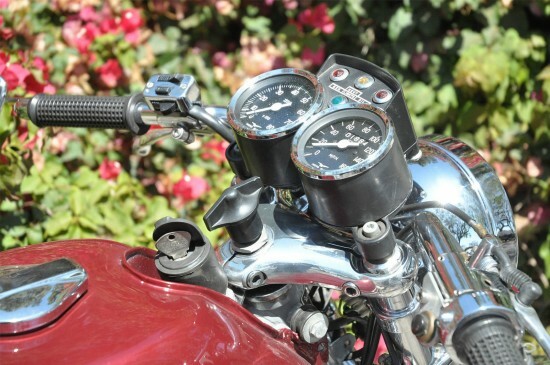 Cycle Garden is a SoCal-based Guzzi specialist and supplier of OEM and aftermarket parts, so it’s also reassuring to know that they’ve been involved: I’ve met a few Guzzi guys who speak highly of them. 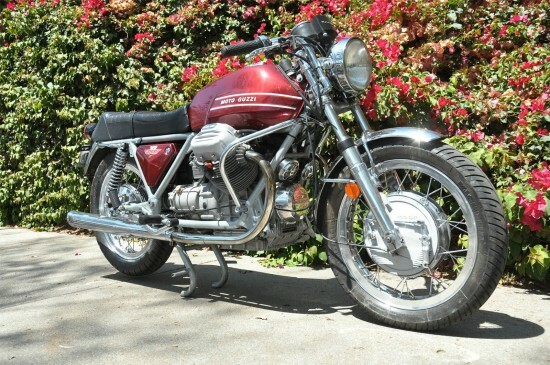 Restored numbers matching 1972 Moto Guzzi V7 Sport – Burgundy & Grey Foam. Purchased from Moe at Newport CA Cycle Garden. This is a 1998 restoration with 2002 miles on the odometer. I have put less than 200 miles on the bike since I purchased it from Moe, and am selling it because I do not have enough time to ride. 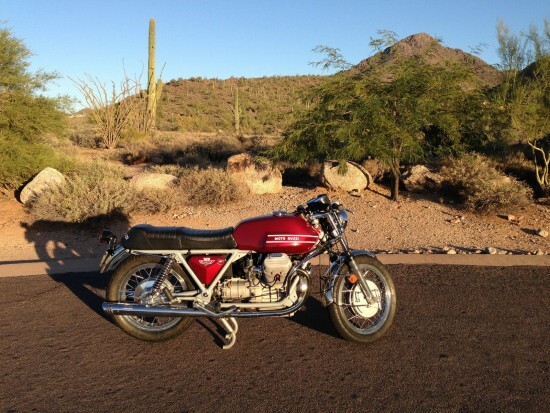 Recently won “Best of Show” at the Go AZ Motorcycles antique bike show. Trophy is included with the bike. The bike is stunning as you will see from the pictures. It runs perfectly, and has never given me a moment of trouble. Starts immediately when engaged, and is very fast. The bike has a European shift pattern (right shift, left brake), which makes it a little different from most newer Sports. Moe added their 955 CC Big Bore Kit (T-3 Crank Shaft, 88 mm Pistons), new paint at the time of restoration, full wire harness, fuse panel, restored the dash, and added reproduction Silentium mufflers. I have removed the bar mirror, but will include it with the sale. Helpfully included are a pair of videos that can be found here and here. $18K ouch! I believe the starting price is the main deterrent. Surprise! No bidders. Who da thunk . . .
I’ve owned and raced V7 Sports in many configurations. The change to the T3 crank and big bore kit completely changes the feel of the bike. The stock short stroke V7 Sport crank was unique to the bike and was much revvier and brilliant. Overall the bike looks pretty correct, although the triple clamps should be matte black. Also, as nice at the drum brakes are for appearance, the disk brake versions worked MUCH better. It’s however an easy conversion with a front wheel and lower fork legs.